Derive an expression for the current in a system like that in Figure 23.11, under the following conditions. 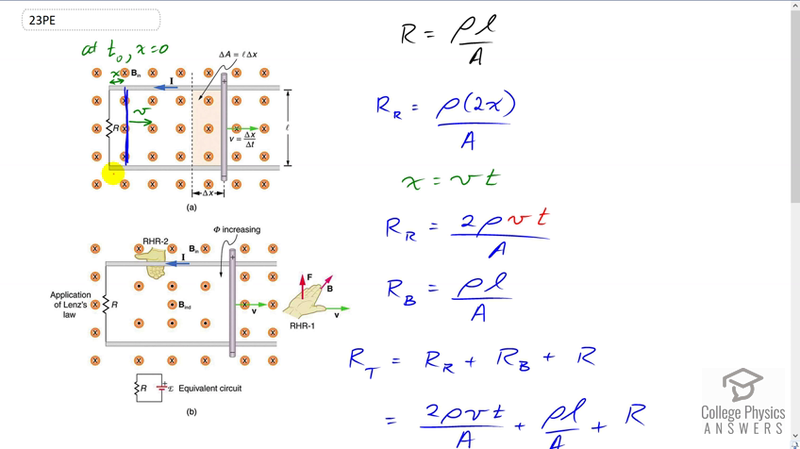 The resistance between the rails is $R$ , the rails and the moving rod are identical in cross section $A$ and have the same resistivity $\rho$ . The distance between the rails is $l$, and the rod moves at constant speed $v$ perpendicular to the uniform field $B$. At time zero, the moving rod is next to the resistance $R$. Figure 23.11 A motional EMF is induced between the rails when this rod moves to the right in the uniform magnetic field. (b) Lenz’s law gives the directions of the induced field and current, and the polarity of the induced emf. Please see the solution video for the derivation. This is College Physics Answers with Shaun Dychko. We're going to derive an expression for the current in this circuit here, which consists of these rails, and this resistor, and this bar connecting the two rails together. So the bar is moving to the right with some speed v, and it begins right next to this resistor so that x initial is zero. And, we need to figure out what is the total resistance of this circuit. So it's going to be resistance given to us here -- that part's easy -- between the rails. And then there's going to be also resistance due to the length of this rail here, times two. Plus the resistance of the bar itself that's connecting the two rails together. Okay. So, resistance in a wire is: resistivity of the material times the wire's length, divided by its cross-sectional area. So, the resistance of the rails is going to be: resistivity times two times x because there are 2 portions of rail here and divided by cross-sectional area and xis going to be velocity times time. And so, we’ll substitute that in for x. And so we have resistance of the rails is two rho v t over A. Now, the resistance of the bar is going to be resistivity times the bar's length, (which s l, we're told) divided by its cross-sectional area and then, we can now get a total resistance which is the resistance due to the rails, plus the resistance due to the bar, plus this resistor that we're given between the rails. And so we substitute for each of these. So we have two rho v t over A, plus rho l over A, plus R. And then we can write this as a single fraction by multiplying R by A over A, and then factoring out the rho, which is a common factor among these two terms, and write it all over a common denominator of A. So we have rho times two v t plus l plus RA over A. So that's the resistance. Now, we know Ohm's law is V equals IR and so we can solve for current by dividing both sides by R. And so, the current is V over R, and the voltage induced in this moving bar is going to be magnetic field strength, times length, times v; that's the formula given in the textbook. And so, there we are. We have B l v times A divided by rho times two vt plus l plus RA. That's going to be the current.